Swine flu is under scrutiny once again as pharmaceutical companies are being accused of hyping up a “false pandemic”. The Council of Europe has put the virus on its winter agenda, which starts on Monday. A representative from the Parliamentary Assembly of the Council of Europe claims the World Health Organization colluded with major drug companies and changed the definition of “pandemic” to ensure maximum profits with no risks for the pharmaceutical firms. If PACE is putting forward the theory that the swine flu hysteria was engineered by pharmaceutical companies to generate revenue, then Ukraine is a perfect example. The first revelations of the flu epidemic in Ukraine back in October 2009 caused panic across the country. News of the pandemic dominated the agenda of most of the Ukrainian mass media. Public reaction was so strong that all anti-flu products flew off the shelves of pharmacies and drug stores across the country. In the first several weeks of the flu rush it was almost impossible to find any medication against it in the pharmacies due to panic buying. Of course, pharmaceutical companies in Ukraine profited from the hysteria. This continued until the late stages of November 2009. The joint profits of all the pharmaceutical organizations in Ukraine in October 2009 alone amounted to over $200 million, which was more than they had earned during the entire year before. Thoughts about the “epidemic outbreak” resurged right in the middle of the presidential election campaign in Ukraine. Public mood suggested that the epidemic was being used by politicians as one of the factors in the campaign in an attempt to gain more votes from the electorate. The biggest controversy surrounds the antiviral drug Tamiflu, which was believed to be the most effective means of combating swine flu – not in the sense of actually preventing the disease, but curing a person already infected with the virus. 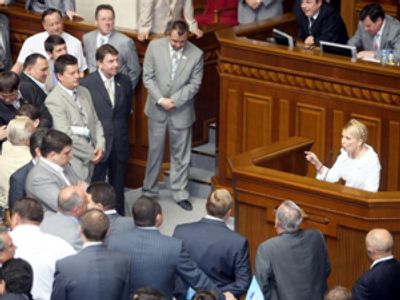 When the first delivery of 300 tons of Tamiflu was delivered to Ukraine, Prime Minister Yulia Timoshenko revealed that some pharmacies had already sold the drug at ten times the original price. She declared that any private pharmacy which demands steep prices for the drug would suffer legal consequences. Later on she announced that the Tamiflu drug that Ukraine had received from Switzerland will not go to pharmacies, but directly to hospitals to help those already infected with H1N1 (the proper term for swine flu). Despite Tamiflu being presented as the most effective medicine against H1N1, a respectable British medical journal wrote later on that it was doubtful whether the medication could actually help anyone suffering from H1N1. As it turned out, the number of those who died of swine flu in Ukraine turned out to be less than the country loses annually due to regular seasonal flu, so the supposed swine flu epidemic is of little concern now. Currently, all registered flu-related deaths in Ukraine are attributed to the ordinary flu virus strain. Since swine flu does not make it to the headlines anymore, it looks like the previously announced purchase of anti-flu vaccine from countries like Canada and Switzerland have been cancelled. Dr Wolfgang Wodarg, the Chairman of the PACE Health Committee, told RT that the “World Health Organization is the institution that holds the biggest responsibility” for spreading news about “pandemic” swine flu. The expenses that followed the marketing used on scientists to impress governments to make contracts have already totaled billions of dollars, said Dr Wolfgang Wodarg.